Angkor Wat is the first thing that comes to mind when anybody mentions Cambodia. The scale and grandeur of the temples are unparalleled throughout the world. And Siem Reap is the gateway to this world of former glory and riches of erstwhile Khmer empire. Around 2 million people visit the temples and Siem Reap is their base for their exploration of the temples. Such kind of mass tourism is bound to have some adverse impacts any city. More so in an underdeveloped place like Siem Reap. Therefore acts of responsible travel in Siem Reap become important. Supporting the local communities and trying to have the least impact on the environment is essential. Needless to say, Angkor Wat has to be the first thing that you visit in Siem Reap. However, you’ll can to leave a positive footprint while choosing your mode of exploration. Tuk-tuk drivers are aplenty in Siem Reap. Most of them will have a standard Grand Circuit or Small Circuit tour of the temples which is good if you only have a day. However, it would be an injustice (and impossible) to try and cram everything in a day. Take your time, around 2-3 days to give yourself time to marvel at this iconic destination. A tuk-tuk driver can help you do this exactly. Many of them have been doing this for years, however, it is up to you to state your requests and get it customized. By hiring one, you help in keeping money in the local economy and the small businesses. A highly recommended driver is Jimmy. Jimmy is a tuk-tuk driver with a heart of gold and aims to educate and uplift the lives of local kids in Siem Reap. A tuk-tuk driver by day and English school owner in the evening, he donates 60% of his profits towards running his schools. Unfortunately, at the time of my visit, Jimmy was recuperating from an accident and I could not hire his services. But fellow blogger Matt did so and wrote about it here. I discovered them when I was walking around the streets on my last afternoon just before I was about to leave. They run tours of Angkor Wat with their fleet of solar-powered electric cars and 100% recyclable. All their drivers are ex-tuk-tuk drivers and have additional benefits like skill development training, health insurance, fair wages. 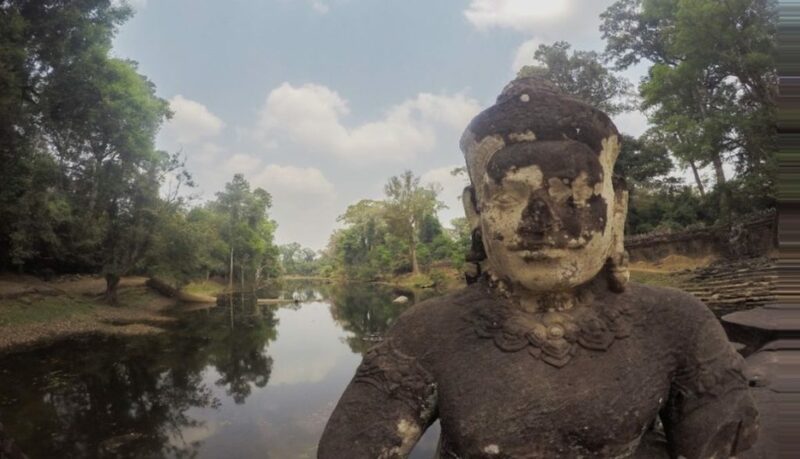 Cycling around the ruins of Angkor Wat is another great way to explore the temples. As long as you keep yourself hydrated and spread your rides over a period of 2-3 days, you should be ok. The heat can definitely get you if you try to cram it all up in a single day. The White Bicycle project is the largest bicycle rental service in Cambodia and they use proceeds from the rental of bicycles to support sustainable projects and non-profit organisations. In 1991, Dr Beat Richner came to Cambodia to assist in rebuilding a children’s hospital that was destroyed during Khmer Rouge. He left his life comfortable life in Switzerland to dedicate his life to the most vulnerable in Cambodia – the children. He performs a Cello concert every Saturday at Jayavarman VII Children’s Hospital Concert Hall in Siem Reap. His performances are a way to generate donations that can help with costs associated with running a hospital for the needy and the underprivileged. The hotel is a part of Maads Asia group that embodies the spirit of sustainable tourism like their other property in Phnom Penh. This hostel is part of Mad Monkey Hostels chain which is quite popular in SE Asia. Mad Monkey Hostel, Siem Reap claims itself to be the best party hostel in Siem Reap. However, far from the assumption of them being just a sunburnt tipsy backpacker hub, they do a lot of for the communities that they work in. Be it supporting children’s education, providing clean water or funding community art project, Mad Monkey Hostels takes its role in promoting responsible tourism very seriously. Street Stalls along Sivatha Boulevard and/or Pub Street. There are a number of street food stalls along the Pub Street of Sivatha Boulevard. And most of the dishes go between $3-5. If you notice the number of people and the turnover of patrons, it’s easy to conclude that the food is as fresh as it could get. Moreover, with all of them being owned by locals and serving local food you can be sure your money stays in the community. I came upon this cafe while walking along the streets on my last afternoon in Siem Reap. http://www.joetogo.orgJoe to Go displays work of a lot of local artists. They also work with Global Child Foundation to educate former street kids. And the drinks are lovely too. As is well known, Siem Reap and the temple of Angkor Wat complex are some of the most visited historical monuments of the world. Needless to say this puts a lot of pressure on the local environment as well as tourist infrastructure. Therefore mindful travelling is necessary to maintain the grandeur of the temple complex and the city for the future generations.